WASHINGTON DC, March 22, 2011 - The stories of returnees coming home from abroad resonated strongly with a Washington audience during the panel discussion "Homeward Bound: Chinese Reverse Migration and Identity" at Asia Society Washington. 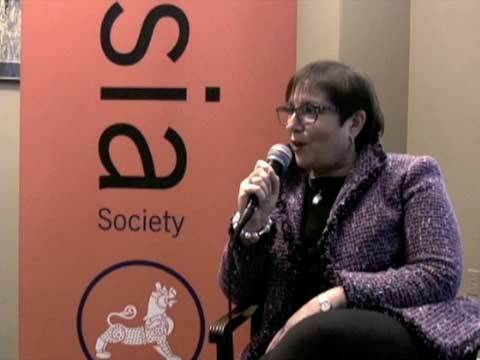 The event featured CUNY Professor Nan M. Sussman, who discussed the profound differences in the return migration experiences of Hong Kongers and Westerners returning home from abroad. Sussman was joined on the panel by Dr. Patricia Chu and Dr. Robert Shepherd of George Washington University. Sussman described different responses, shaped by cultural identity, to having lived overseas and returning home. She explained that her original research with this topic had to do with Westerners returning home, and described that response as overwhelmingly "subtractive," meaning that her subjects felt they no longer fit in with everyone else. For instance, a former Peace Corps volunteer who had worked for two years in Peru told Sussman, "They didn't care about the problems of the Indians in Peru, and I didn't give a damn about what happened to the Indians in Cleveland." In Hong Kong, however, Sussman found that the experience of people returning home was largely "additive," saying this response was typical of people "who retain their home cultural environment but also add onto it the culture of where they immigrated to." Hong Kongers possessed multiple cultural identities before the "wave of anxiety" that hit the city before 1997 (the year of its return to mainland Chinese rule). "Hong Kongers describe themselves as having a core of Chinese values with an overlay, after 150 years of British rule, of Western values, in addition to a Hong Kong identity which is separate from China's." Because Hong Kong residents already had this sense of working in multiple styles of culture and language, "There was nothing that precluded holding multiple ways of thinking, behaving, working, and that you could move back and forth between these styles depending on the context." Chu, whose research is in Asian American narratives and their return experience, spoke about the history of Asian American accounts of returning home. She described her own family's experience of migrating to the United States, and spoke about the narratives of diasporic Chinese returning home from the 19th century onwards. She remarked that "Lilly Wu's narratives suggest how deeply interconnected place ethnicity and identity can be, and raises questions about diasporic Chinese identity," adding that the Chinese Diaspora identity "can be informative in unexpected ways." Shepard praised Sussman's work, and commented on "class status as connecting to passport status," when people go abroad. In addition, he described the majority of Hong Kong migrants as coming from upper socio-economic classes. As well educated, comfortable, and cosmopolitan people, their experience was necessarily different from that of other groups. In the lively Q & A session that followed, many in the audience shared their own stories about returning home or meeting people from their home countries abroad. One young man from China described the intense frustration that he experienced while working for Senator Al Franken in dealing with a Chinese delegation that treated him harshly. An American woman who had lived in Sri Lanka for ten years said that she was going back there the following month due to the difficulty of living in America again after such a long time away. The panelists responded by saying they had spoken to dozens of people who had undergone similar experiences, and that those audience members weren't alone in how they felt.